Maybe I’m crazy but I do not believe the newly labeled AppleTV 4 announced on September 9th is the big step into the living room Apple was hoping for and was prepared to introduce at June’s WWDC. I do believe that Apple was almost there and at the last-minute, changed their strategy, whether out of frustration with negotiations, or as a conscious determination to change tactics Apple pulled the hardware and instead offered the Apple TV 4, I am convinced that newer hardware is on the way and here’s why!If you believe like many others that Apple was ready to make the announcement in June at WWDC, then the hardware we were recently shown, hardly justifies the relatively long wait between June and late October for a product. It appears to me that Apple quickly changed direction and retrofitted some of the new internals into a fatter version of the same boring hockey puck pushing it on the market in time to gather holiday sales and seed the market with apps and units. This along with the fact that Apple held back some critical features that have been ready to go and essential to compete in a relatively crowded field is proof to me at least , that new hardware is still in the offing. Many people agree that Apple must be able to provide content packaged together at a price cheaper or equal to the cable companies in order to compete with the already locked in cable providers. By all accounts this is the path that is frustrating Apple’s chief negotiator Eddie Cue. However I believe, that there are actually two things, needing to happen before Apple can break this Gordian Knot known to us as Television. The first is a strategy of providing content producers a method of bypassing the middlemen cable/ satellite companies by creating a package of bundled programming. This strategy can provide a menu of unique programming both live and past available to the consumer to choose from. The content can be providing either as ad-supported or subscription supported content providing consumers with the option of eliminating commercial content, think PBS. Or as we have heard rumored, Apple can use its considerable clout to broker a special combo of premium programming into a bundle much like cable companies do today but with added benefit of Apple foregoing the middleman’s cut, thereby reducing cost. This has long been the Holy Grail of “cord cutters” a term used to describe the growing numbers of dissatisfied cable customers who have cut the cable cord and patched together programming though internet content providers like Netflix, Hulu, Amazon, HBO etc. Apple’s strategy, developed and perfected by Steve Jobs and now being propagated by Eddie Cue, essentially saved the Music business from themselves and may be still be able to save the publishing business, but I digress. More relevant to this topic Apple’s strategy has engorged the cellular phone companies with profit, opened up as well as revitalized the entire computer, software business , propelling Apple to become the most successful company in the history of the planet. This strategy not only has served to enrich Apple but also providing benefit for both the consumer and those affected industries, in this case cellular providers. No doubt we can expect the cable companies to be dragged kicking and screaming by Apple into the new world order. To its credit Apple has been willing to take on that risk of waiting while or until it dawns on the providers that this approach will prove beneficial to them as well. For their part providers can save themselves from the constant distractions of the stand offs with content producers over content, placement, cost and channel gyrations and the bad publicity they inherit from it. Instead they will be free concentrate their efforts on building out the their infrastructure in order to compete effectively by providing the “pipes” just as their cellular counter parts are now profiting from. Another added benefit is that content providers will endeavor to offer better quality programming in an effort to compete rather than formulating content to attract advertisers. This is the Dream of Television we all held dear in the fifties and sixties. Many television aficionados myself included believe that this shift will revitalize the original noble dream of Television. I believe that either those negotiations to provide a packaged solution fell apart before June’s WWDC or Apple became frustrated with its progress and decided to utilize the iTunes Strategy by going to war so to speak with the content providers and offering the “app solution”, It’s also possible and highly likely that Apple is pursuing both strategies simultaneously. The second feature that I rarely hear discussed and is I believe also essential for Apple to be successful in creating a quality customer experience is the greatly under appreciated Programming Grid. While Siri search is greatly needed and appreciated it does not solve the other basic need. Most people do not know what they want to watch before they see it while channel surfing within a grid. The excitement of discovery is unquestionably powerful and unique to television. The concept has been with us since televisions inception. Before the current crop electronic versions we had our printed version better known as The TV Guide. I believe Apple appreciates this and intends to implement this. Recent Apple patents filings have illustrated just a grid displaying live programming from apps. Apple would certainly be justified in revealing some these features from the eyes and copy machines of their competition while they put their strategy into place. Let’s start with hardware design. Really ? Is this the best Apple could do ? 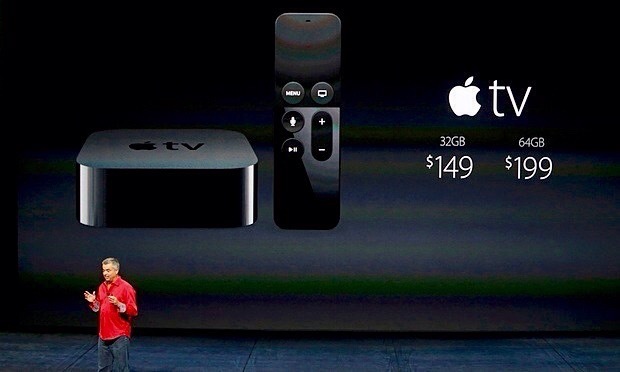 Look at Tivo’s Apple tv competitor below. Can Jony Ive sleep at night knowing that the future of TV will look like that fat black hockey puck. I don’t think so. When they are ready to introduce the New Apple TV it will be something designed with Jony Ive’s grace and simplicity maybe featuring information displayed up front. More storage options more powerful faster hardware, to facilitate better gaming and HomeKit. 4K resolution, this requirement by itself is proof that Apple will introduce new hardware. 4K is ready to go, its competitors have it now and Apple must provide it. If they intended this model to be its showpiece they would have included it. In typical Apple fashion the current hardware will be discounted to maybe $99 when these new features and hardware available. Probably sometime in Early 2016.